Opening an online business? Selling products online? If so, you’re going to need a reliable ecommerce platform to build your online store. The top ecommerce platforms featured on this page are worth looking into before starting your project or transferring an existing one. I’m going to keep this list focused on hosted ecommerce platforms. So if you’re interested in a self-hosted solution, this isn’t for you. Hosted shopping carts are easier to work with, don’t need a separate hosting account, and offer structured support. Stop wasting your time reading numerous ecommerce comparisons and just go with the one that covers most of what you’re looking for. When looking for the top ecommerce platforms for your online business, it’s important to choose the one that covers most of what you’re looking for. Of course, you’ll never find a shopping cart that fulfills your needs completely. Bigcommerce has the biggest selection of built-in features including the abandoned cart saver, product reviews and ratings, Google Trusted Stores integration, SEO optimization, email marketing, and an integrated blog. The ability to sell various types of items including physical products, digital downloads, services and events. Bigcommerce has integrated real-time shipping rates from major shipping carriers. Bigcommerce is fully integrated with over 65 payment gateways. Features the editable homepage slider that’s ideal for running promotions and showcasing your newly released products. Free access to Bigcommerce University where users can educate themselves on building an ecommerce empire. The $29.95 plan has transaction fees of 1.5%. Bigcommerce no longer charges any transaction fees. An affiliate program isn’t built into the platform. Although, I am pretty sure there’s an app that can integrate an affiliate program into the store. The abandoned cart saver is excluded from the $29.95 plan. Transaction fees: Up to 2% based on plan selected. Transaction fees can be waived by using their payment gateway. Shopify has the largest ecommerce app store in the event you find yourself needing more features. Shopify has a clean admin backend and storefront, making their cart very easy to use and appealing to customers. Shopify has a solid set of features such as the abandoned checkout recovery, drop shipping capabilities, complete blogging platform, email marketing, and the ability to sell on Facebook. Shopify is fully integrated with over 70 external payment gateways, both domestic and international providers. The checkout experience can be translated into 50 different languages. One could manipulate the themes settings to make them translated as well. Shopify offers extensive support options and give store owners full access to “Ecommerce University.” This is the place to learn everything you need to know about selling online. Transaction fees up to 2% based on plan selection. These can be waived by using their payment gateway. Shopify uses a custom template language called liquid. This might be an issue for users trying to edit their themes. The cheaper plans limit certain features such as the abandoned checkout recovery, professional store reporting, and real-time carrier shipping. Volusion offers simplified management tools for controlling inventory and product variants such as size, color and style. Volusion has advanced optimization tools that are built right into the platform. Volusion offers a good feature lineup including deal of the day, gift cards, coupons, customer product reviews, and simple social media integration. If you happen to need additional features, Volusion has an extensive list of external applications that are fully integrated with the shopping cart. Volusion is able to integrate with some of the most popular payment gateways such as PayPal, Authorize.net, Stripe, and many others. On top of the traditional support options, Volusion offers an ecommerce blog, filled with tips, and tutorials on running an ecommerce website. Since all plans have limited bandwidth, Volusion charges overage fees for crossing over your monthly bandwidth limit. Current overage fees are $7 for each gigabyte that goes over. Many of the cheaper plans limit features. This could mean that one would have to upgrade to be able to use those features. 3dcart has advanced features built into the cart. Some noteworthy features include email newsletters, daily deals, group deals, autoresponders, product questions and answers, multiple ship to addresses, affiliate program, and gift registry. No transaction fees on any of their monthly plans. 3dcart offers an array of optimization tools to help you get the maximum exposure and outrank your competition on the popular search engines. A majority of their themes include the new HTML5 markup language and are responsive across multiple devices. 3dcart has a neat, easy to follow PDF guide for transferring an existing online store. 3dcart supports about 90 payment gateways, both domestic and international. They offer a built-in point of sale system (POS) that allows you to sell in person. Bandwidth overage fees are $5 for each gigabyte over your designated monthly limit. Cheaper plans limit certain features. Their ecommerce platform offers over 100 stylish and user-friendly ecommerce themes. Strong feature lineup such as a built-in phone order system, point of sale system, widgets, refer a friend program, reward points system, gift registry, and an affiliate program. The cart is pre-integrated with popular shipping carriers such as UPS, USPS, FedEx, DHL, and Australia Post. No transaction fees across their entire plan selection. CoreCommerce doesn’t limit any of its features on the cheaper plans. CoreCommerce supports multiple store languages and currencies. This is a must if you’re selling in the international market. CoreCommerce does security really well. Limited bandwidth and storage space. CoreCommerce doesn’t integrate well with external applications. Free migration service that can help you transfer your existing store from over 40 ecommerce platforms. When their support is busy, you have the option to leave a message and receive a callback instead of waiting on hold. Their interface allows you to use multiple languages and currencies. A newly redesigned dashboard that is user-friendly. Recurring billing is built right into the ecommerce platform. No transaction fees on any of their plans. Point of sale system (POS) isn’t built into the platform. Limited storage and bandwidth makes them a risky choice for larger online stores. 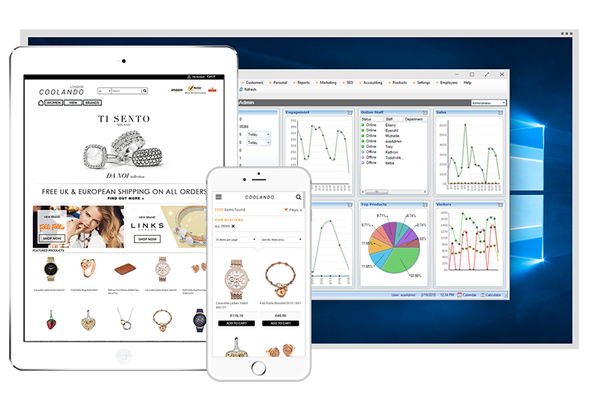 You can run multiple stores using one centralized dashboard for an additional $39/mo. for each new site. An endless list of ecommerce features. Decent selection of both free and premium apps. You can view and manage your files and images using ftp. Their platform is integrated with subscriptions and recurring billing. The ability to sell online or sell in person. Owned and operated by Capital One. Their service is pricey when compared to some of their competitors. Limited products, bandwidth, and storage make Spark Pay a bad choice for larger stores. They offer a free plan for very small online stores. Ecwid is extremely popular, powering over 900,000 stores. Their platform installs and is up and running within minutes. Their platform is global, featuring over 45 different languages. Ecwid supports over 30 payment gateways. Their platform doesn’t charge transaction fees. Possibly the easiest platform to work with. Doesn’t have all of the features you can find on other ecommerce platforms. You have to integrate their platform into an existing website or social networking site. A scalable ecommerce platform that will work for any type of business and size. Recurring billing is integrated into the platform. Email marketing is also integrated right into the platform. The checkout page is fully customizable, doesn’t redirect, and it’s hosted on your domain. Strong multi-app integration with third party apps. Almost every payment gateway is going to work with LemonStand. You can only complete 5,000 orders on a monthly basis. Their platform is very expensive and not ideal for small shops. Fortune3 has some of the most powerful back-office tools. A lengthy free trial period to get to learn the software. Fortune3 integrates well with apps and payment gateways. Their wizard helps you configure your online store without much effort. You’re able to run their software on your PC, work on it offline, and upload it to your server. Their platform may be difficult to learn. Transaction fee if you don’t use their payment gateway. Don’t get me wrong, each of the top ecommerce platforms above can be used to create a successful online store. The reason I would choose Bigcommerce is due to its flexibility, no limitations on what you can do, readiness for the future, and an array of built-in features. Think of Bigcommerce as a stock car that is really good and think of the other platforms as good cars needing some upgrading under the hood. In shortest and simplest words, Bigcommerce has a little bit of everything, making it a complete ecommerce solution. I really think you can open and run a successful online store with either shopping cart you choose. It all comes down to your level of expertise, willingness to learn, and having profitable products to sell. While I recommend Bigcommerce, I understand it might not be the solution everyone is willing to work with. That’s why it’s important to take advantage of the free trials being offered as they give you a chance to test out each shopping cart. Lastly, I also understand that we tend to skip from comparison to comparison and lose a lot of time that could be spent on building an online store. Stop wasting your time reading and use your valuable time to pick a shopping cart and start building your online business. Which shopping cart do you use and would recommend?